WASHINGTON, DC--(Marketwired - Dec 5, 2016) - Every four years, the presidential inauguration promises to inspire a sense of patriotic awe in everyone who witnesses it. Seize the history-making moment, and see it all first-hand when you reserve the Inauguration Package at the Fairfield Inn & Suites Washington, DC/Downtown. The package experience begins as soon as guests arrive at the hotel. In addition to the property's enviable address among Washington, D.C. hotels -- it's situated just minutes away from the White House -- visitors will be greeted with a fruit platter and bottle of champagne. For those attending an inaugural ball, this welcome amenity sets the perfect tone. For everyone else, it provides a refreshing respite before heading to the National Mall to witness the inaugural events. After the speeches and the celebrating, guests can return to this downtown Washington, D.C. hotel to unwind in a King Studio Suite. The upgraded accommodation, which is included in the package, offers a presidential experience with a spacious layout and value-added amenities like free Wi-Fi, premium movie channels and plug-in technology. The inauguration promises plenty of city-wide buzz, and guests will find themselves conveniently positioned to enjoy the best of everything. Near the Verizon Center and Chinatown, the hotel makes the city's museums, attractions, restaurants and shops all easily accessible. Or guests can stay in and enjoy a workout in the fitness center and pub fare in the hotel's Irish Channel restaurant. As the ceremonies and festivities draw to a close in Washington, D.C., this hotel deal includes a parting giftbasket of souvenirs by which guests can remember the inauguration. After all, it will be another four years before the fun begins again. The Fairfield Inn & Suites Washington, DC/Downtown welcomes visitors to the nation's capital with contemporary style, practical amenities and a desirable location. Offering some of the most competitive hotel deals in the Washington, D.C. area, the property combines stylish accommodation in the heart of the city at a terrific value. Visitors will enjoy free Wi-Fi and complimentary daily breakfast to fuel productivity, while guest rooms and suites encourage relaxation via flat-screen televisions, well-lit workspaces and plush bedding. Guests can stay active in the fitness center or by walking to a wide range of nearby attractions. Both the White House and National Mall are within steps of the hotel, while the Metro puts the rest of The District's countless attractions easily within reach. Plus guests traveling for business will find themselves just steps away from the Walter E. Washington Convention Center. At the end of the day, visitors can unwind over dinner and drinks at The Irish Channel, the hotel's savory pub. As the Inauguration draws near, book your stay now and enjoy some presidential perks while staying at the Fairfield Inn & Suites Washington, DC/Downtown. 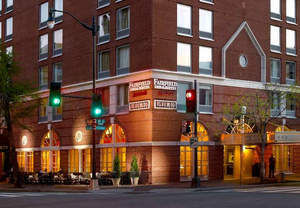 To book your stay at the Fairfield Inn & Suites Washington, DC/Downtown, click here.